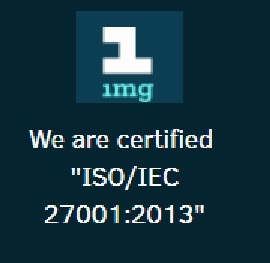 Recently 1mg Technologies was accredited with the ISO/IEC 27001:2013 certification. ISO/IEC 27001:2013, also known as 'Information Security Management Systems (ISMS)', is an independent voluntary certification which lays out implementation and management guidelines to safeguard digital information such as financial data, intellectual property or sensitive customer information. This robust framework also helps in identifying risks and puts in place security measures that are right for businesses, so that they can manage their information prudently. It helps in continuous review and refinement of the process. Having ISO 27001 certification ensures that an organization has implemented the required legal, statutory, regulatory and quality standards to protect all sensitive information against unauthorized access. There has been a huge information imbalance in the field of medicine and 1mg.com has been working towards providing reliable and authentic medicine related information to the consumers for close to five years. 1mg.com has received the ISO 27001 certification for compliance with the international standards, making it one of the pioneers in the Indian healthcare industry to achieve this major certification. This certification will further enhance the focus of the company towards process of continuous improvement and innovation. 1mg.com has made its mark across India for being a pioneer in providing integrated healthcare services through digital platform. 1mg.com is one of India's leading digital consumer healthcare platform providing access to allopathic, ayurvedic, homeopathic, health supplements and other health-related products at consumers' doorstep across India from licensed and verified pharmacies. 1mg.com also provides e-diagnostic with free home sample collection and e-consultation services through its integrated healthcare platform. 1mg.com has strived to make health care accessible to millions by giving them quality care at affordable prices.